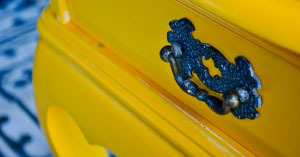 Acanthus offers “lovely decor elements for the home” like baskets, knobs, shelving and more. They also sell a wide selection of chalk paint for all of your home decorating needs! It’s hardly junk! “Deer Creek Junk is all about repurposing architectural, vintage, and antique objects and bringing the artistic beauty they contain, back to life.” Like their motto says, they really do bring great items back to life! Check out their stuff in Cedar Creek Interiors in Traverse City or at their East Jordan Warehouse. This store is a funky treasure trove off the beaten path. It’s almost impossible to walk out empty handed with all of the goodies galore! They have satisfyingly unique furniture and small finds that will keep you coming back. It’s a different store every day! They also sell a variety of paint colors from American Paint Company and offer great workshops that teach transformative paint techniques. Call or check their Facebook page for paint workshop dates. The Red Dresser has been a great place to find deals and unique items for years! Now that they are in their new location there’s even more room for treasures than before! Pick out a great item for your home like a funky dresser or maybe a cute pumpkin. They also offer chalk paint workshops regularly so keep an eye on their Facebook page for updates. They carry Annie Sloan Chalk Paint and provide plenty of workshops to help you learn the ropes! If you are looking for a well preserved piece of furniture that is vintage or just cool, check out Then and Now.